Extended UHF TX. Also VHF/UHF/Cellular RX Modification by G1IVG. (To select the different UHF bands after the modification you must make sure that you are in UHF VFO mode, then press <F> for two two seconds and then <LOW>. This toggles the different UHF bands). Remove the four screws on the rear of the radio (not the belt clip screws). To open the radio, I found it best to put your thumb into the battery compartment and by applying slight pressure on the inside of the rear cover, with your thumb the radio will open. As you open the case, take care not to damage the ribbon cable. Put the radio face down on a clean surface with the front of the radio facing down and to the right. The back of the radio should then be to the left and on it's back. Look at the photo below for the location of the surface mount resistors. 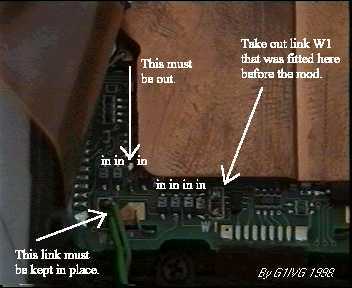 On my radio, originally there were two green link wires fitted to the PCB. The photo below shows my radio after modification. The wire link to remove is "W1". However leave link "W2" in place. Now you need to configure the small surface mount resistors as shown in the photo. Just copy the configuration as shown and this will give you the coverage printed above. Take care when removing the resistors as to much heat from your soldering iron will lift the PCB track and possibly destroy your Kenwood TH48. If your not sure then ask an experienced technician to do the soldering etc. Then reassemble the radio, taking care not to trap the existing link wire "W2" between the two parts of the case. Also take care again of the ribbon cable. Layout of surface mount resistors and green link "W2"
These modifications work 100% on my own Kenwood TH48E, the serial number of my radio is 60100848. However I can't guarantee they will work on your particular model. (The serial number can be found inside the battery compartment of the radio).